1930’s Monterey Colonial Revival "AFTER"
This 1930’s Monterey Colonial Revival home exudes all the charm that you would expect, until you enter the kitchen. The home owners, a young, professional pair, asked me to assist them in the remodel of the kitchen. They wanted to keep the existing floor plan, and add to the charm and original details of the space. We discussed the location of the sink and decided if we moved it to the other wall, it could be centered under the window, thus making it a more pleasurable when working at it. This created a long and more functional countertop to the right. We chose Caesarstone for the durability and ease of maintenance in a Carrera marble look for the countertops. This is complimented by the gray subway style tile backsplash with crisp white grout. State-of-the-art appliances were included in the new floor plan: a microwave set in the upper cabinet, wine cooler below, new dishwasher with a panel to match the cabinets, a new stainless steel refrigerator, and a new professional style range and hood. The alcove for the range received the same tile backsplash, but we used a herringbone pattern to accent the feature wall. We also created a niche in the side wall to provide handy storage for spices. The base cabinets contain spice pullout storage. The original wood framing around the alcove was treated to a new coat of white paint to match the cabinets. 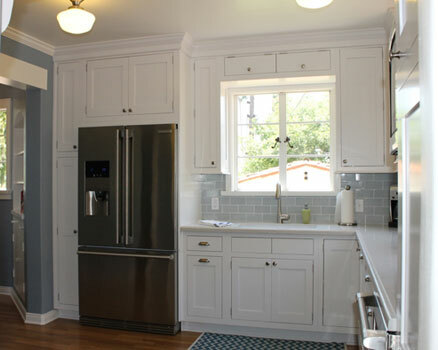 The new cabinets, a simple shaker style, are very appropriate for the period of time when the house was built. We added crown molding and casings to the windows to complete this period style. We were able to shift the utility cabinet to the left of the refrigerator, and install a 5 pull-out shelf pantry to the right of the wine cooler. The home owners asked for a pull-out trash unit and this was placed to the left of the sink. To the right of the sink is a corner lazy-susan unit to maximize storage. With this in mind, we added 2 small storage units at the ceiling above the sink. In keeping with the 1930’s period, we selected 2 school house style ceiling fixtures that have energy efficient LED’s for the kitchen. The hood also has LED lights. The adjacent breakfast room received the same blue-gray paint on the walls and white trim. We kept the original ceiling light. All the existing metal casement windows were stripped and painted white. The old linoleum flooring was replaced by oak floors stained to match the original oak floors in the rest of the house. With a nod to the original architectural style of this home, we achieved a functional and stylish make over that will be a pleasure to work in for many years to come.